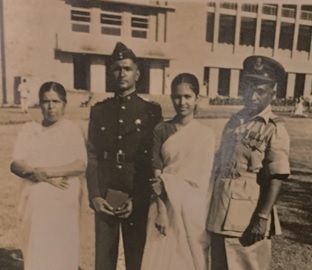 It’s now 60 years since we boarded that truck in Kirkee station to take the long ride to Khadakvasla and hear the welcome address by Sub Maj Borah. We were a motley bunch in Easy squadron from the amiable 2992 Monojit Pakrasi to 2996 Suresh Sharma to 3007 Joseph Thomas. Three years and many front rolls later, we graduated with 3004 Kanwal Dev Singh as our ACC and gold medalist. 3007 got the silver medal and changed the squadron name to Hunter. The name has stuck. In those days, air force cadets were “non-tech” but 3007 was always determined to keep up to date on the technical aspects of aviation. 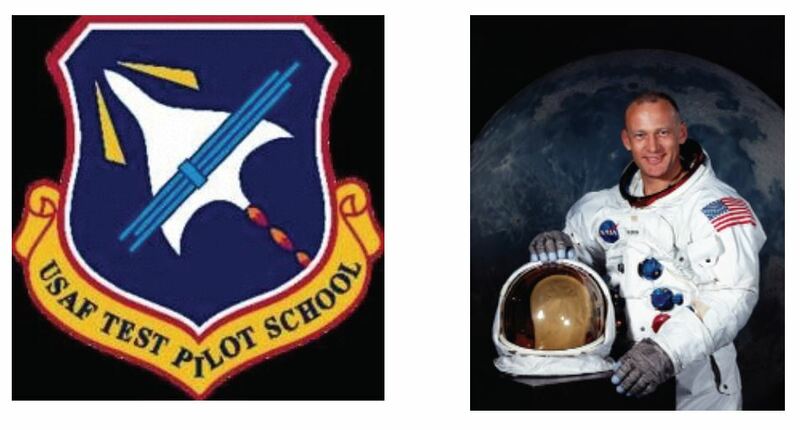 On his own he cleared the Aeronautical Society exam and went on to become a test pilot, training under Colonel Buzz Aldrin of Apollo 11, the first moon landing. 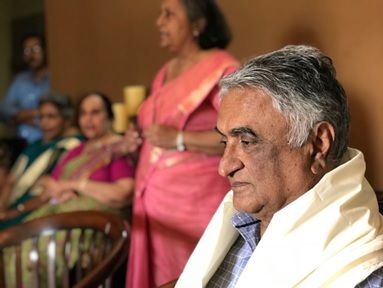 On his return to India he started the Test Pilots School, the fifth such school in the world and the first in a developing country. His students include both Indian cosmonauts, one naval chief and many air marshals. 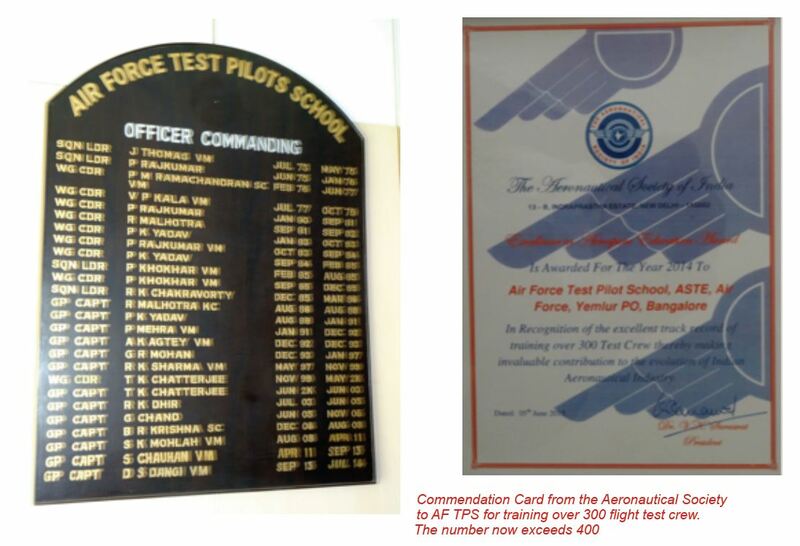 The school has developed into a premier institution and currently trains test pilots and test engineers from the army, navy, coast guard and the air force. The test engineers are awarded MTech from University Visvesvaraya College of Engineering (UVCE), the fifth oldest engineering college in India. Even though the test pilots undergo the same syllabus, they have not yet been accepted for MTech because their first degree is BSc. 3007 has been an all rounder. 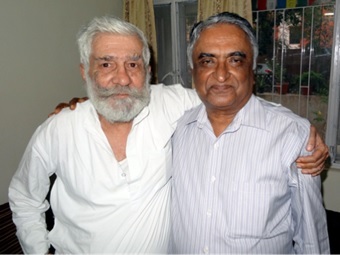 He has taken part in 3 1/2 wars — 1962, 1965, 1971 and the Kutch operations of 1965. He has commanded the most decorated squadron of the IAF while flying the Canberra photo reconnaissance aircraft. 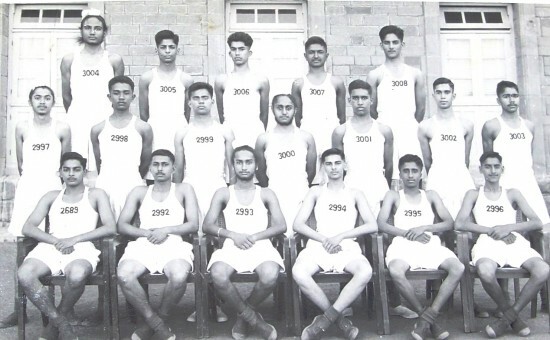 He was the Sailing captain in NDA and has also represented the air force. On becoming medically unfit for flying, 3007 took early retirement in 1984. Fiercely independent, he refused all job offers and struck out on his own. In 1987 there were floods in Delhi and he realized that the flood control engineers were ignoring the basic laws of fluid flow. He wrote a paper on flood control, advocating de-silting of rivers by dredging. It was accepted by the Flood Control Dept of Delhi Administration and the Central Water Commission. They did buy a dredger as a result but so strong is our intellectual slavery that they also continued the old practice of constructing bunds and compensatory drains. You see, the latter practice was developed by US Army Corps of Engineers in the 19th century. Back in 1987 the internet did not exist. 3007 did not present papers at seminars and did not actively canvas for the improved method of flood control. He was busy earning a living and pursuing the India China border issue. 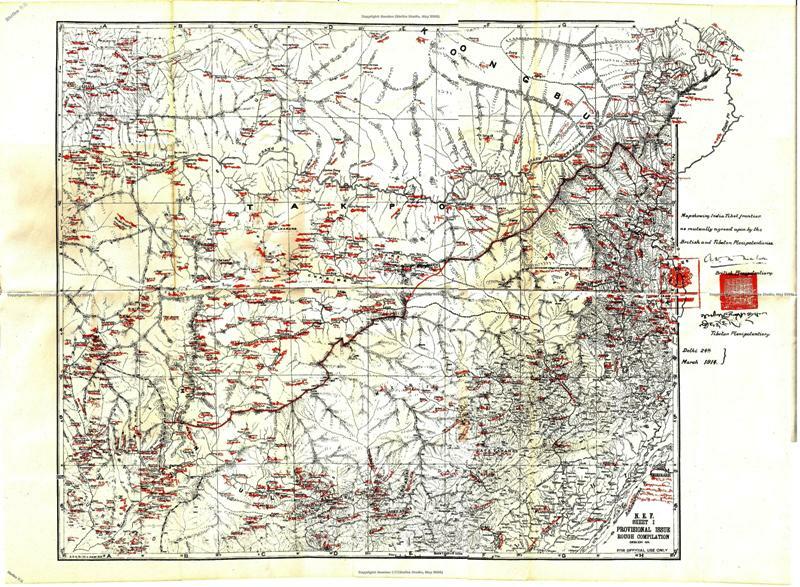 (See China – India Border http://amolak.in/web/sino-indian-border-the-way-forward-by-j-thomas/ ). Then in 2014 a catastrophic flood occurred in Srinagar. 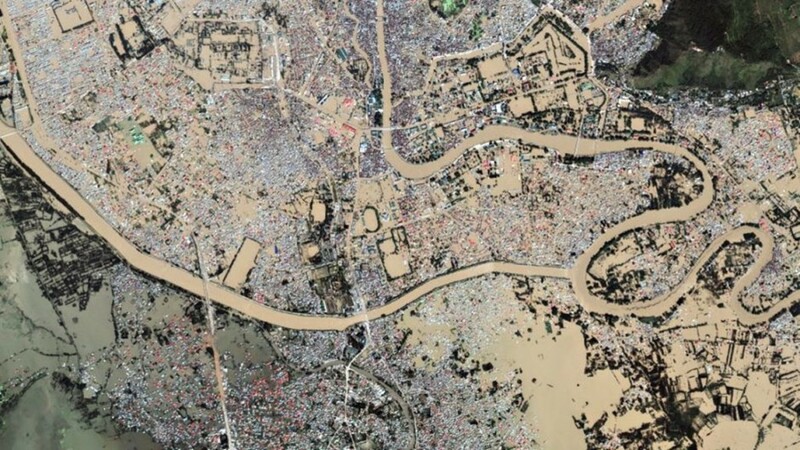 The entire Jhelum river emptied into the city and many areas were submerged under 25 feet of water. 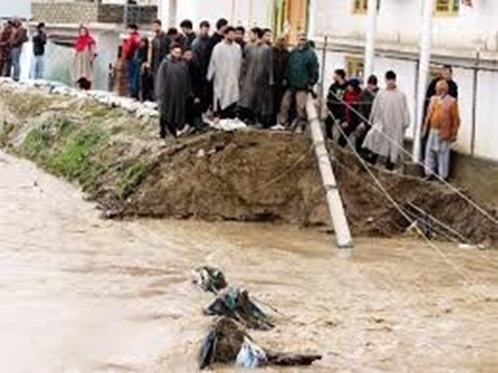 http://amolak.in/web/flood-prevention-in-the-vale-of-kashmir-by-joseph-thomas/#comments was published on 20 Sep 14, just two weeks after the floods started. The internet has changed everything. We were able to include pictures and directly contact people in Kashmir. 3007 took pains to reply to every single comment. Dr Shibu Mani, professor from Centre for Disaster Management, Tata Institute of Social Sciences, Mumbai noticed our blog and took the trouble of visiting Bangalore and spending a full day with 3007. A breakthrough occurred when a former Chief Engineer of J&K State became convinced and pushed the idea. 3007 did not stop there. He put Google alerts on anything written about flood control in Kashmir and followed up with comments and personal emails. Diverting the river around Srinagar is feasible but at prohibitive cost. Firstly, a lot of land is required. Secondly, a large number of bridges will have to be built across the new river channel. Thirdly, when the new river channel gets silted up, embankments will be built on either side. Eventually, the river will again flow above street level. We will be back to square one. 3007 believes that a lot can be accomplished if one is willing to give the credit to others. Courtiers thrive by taking credit for work done by others. But courtiers serve an important role. They have the ears of the raja and can influence him in subtle ways. And so it has been. 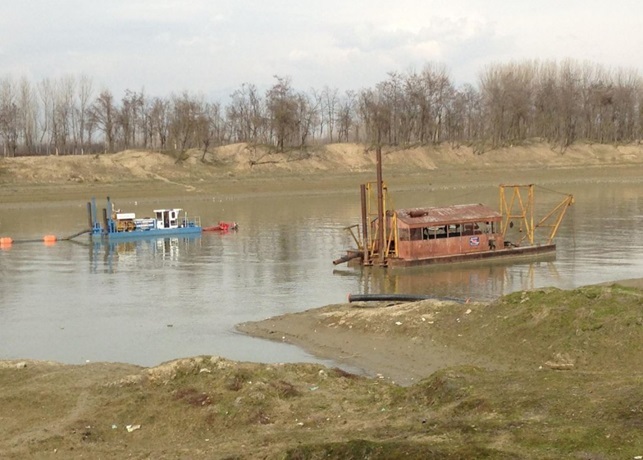 We are glad that the discourse about flood prevention in Kashmir has shifted to dredging. It is now only a question of time for large scale dredging to take place in the Vale of Kashmir. Public opinion is paramount in a democracy. 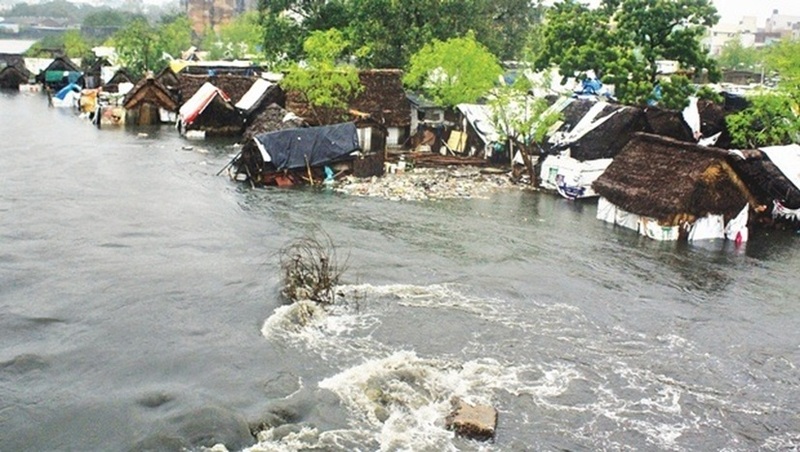 Cooum river in Chennai overflows its banks. Photo by Martin Louis. A thought provoking article. Thank you very much. However, while dredging is an option ( albeit very expensive, as brought out in the article) to improve navigability of the river, but isn’t excessive silting due to deforestation and dumping of solid waste into the river by towns like Srinagar, are the main reasons for this malaise? I am sure that has also been factored by the authorities.The long time dredging of Hoogly to save Calcutta port has not really worked, the siting and development of Haldia as an alternative port, besides the Farakka barrage to divert water to Hoogly ( to flush out silt) has also not worked. Maybe afforestation and dredging both need to be carried out till the situation stabilises. Thank you for this. What a unique but simple way to stop flooding. Hope he gets his due one day. This a short comment on what you shared with us—-it comes from a very old & good family friend of ours—-her father was the well known Sapper officer, Lt.Gen. Prem Bhagat,VC. Wingco Thomas’s suggestion is certainly a well thought of & simple solution to a long standing problem which I have seen & experienced during my childhood days of the 1950s when my father was doing G1 19 Div. in Baramullah—-the old Jhelum river could break its banks at the drop of a hat & create chaos. So the government is actually going to start dredging? Has this begun? Or is it still in the planning stages? When we talked about this (2-3 years ago?) I would have never guessed that politicians would end up making this choice. What happened here? How did they end up making this decision? Maj Gen Surjit Singh sends me periodic emails about all the updates to the amolak blogs, but I was not aware about any developments after your article written right after the flooding. Do you think the US Army Corps of Engineers will hear or learn about this solution? When I lived in Clarksville, Tenn for a year, I learned that the city was at an elevation of 565 ft above MSL; the Cumberland River wound its way back and forth across the state including Nashville and Clarksville and emptied into the Mississippi at the west end of the state. I estimated that from Clarksville to the ocean via the two rivers was about 500 miles or so, and that meant the river dropped on average just over 1 ft every mile. You cannot detect even a ripple on the river, it flows so slowly. Our Army Corps of Engineers has built levees and retaining banks to contain the floods from the Mississippi river, but when the water level rose too high after one rainy season, the Corps broke the very same levees they had built and flooded the surrounding farmlands to protect dams and urban areas downstream. (I never did learn if they rebuilt those levees again!). This is a shining example of our American genius at work. Some dredging has been done at Srinagar. The important thing is that the public is now aware of the need for dredging. Earlier, the clamour was for a grandiose project for a second flood channel. You can see the existing flood channel on Google maps and satellite. What it does is to divert part of the flood water from Srinagar to the rural areas. The reasoning is that there is less loss of life and property when a rural area is flooded than when a city is flooded. I once read the forewood to a text book on Political Science. It claimed that Political science is the highest science because all major decisions are political. Should we go to Mars ? Should we permit stem cell research ? Should we permit cloning of humans ? Should we have gun control ? The US Army Corps of Engineers does some dredging in the Mississippi basin. But it is secondary. They have created thousands of miles of levees. Yes, it is standard practice for flood control engineers to breach the very levees they built. Thereby, they divert part of the flood from an urban area to a rural area. The urbanites have more votes. Oh yes, they rebuild the levees they destroy. Number ten signifies, name, confidence, faith, fame and honour and is indicative of “Rise and fall” as the “Wheel of Fortune” must rise go high up and fall, to rise again. The zero effect is the fall and number one brings the individual back to his original position. Thus fortunes are not steady and many fluctuations mark their life’s sojourn. 1. Sharing of knowledge. Whatever one knows in ones life’s short sojourn must be shared. 2. Be positive. Have thoughts of a glass half full, let it not be half empty, nor be too optimistic, to say that it is full. 3. Never be a total pessimist. As when ‘’NO is in one’s ‘pocket’ and you know it well, try and convert it into a YES, by your personal efforts. 4. Ask and you shall know, ………………………..
Can I send you one as a gift….. Delighted to know Thomas’s suggestion has been taken in right earnest to find solution to flood in Kashmir Valley.His contribution in sixties, to India- China Border border dispute, by way of original research and mapping,has been of immense National asset. Our Course’s gift of SUN DIAL to NDA Khadakvasla,had important inputs from Thomas if I remember it correctly. A fine & factual solution tor a recurring problem all over India. Hope the authorities listen & take action. Let them take all credit. ( which they will eventually do ) Hats off to 3007 . I do remember your suggestion put on to Amolak by Surjit. I thought that they may not even read it as they know it all. I am glad they heeded to your sound advise. A great saga of human enterprise for ecological and social well being.Many a times, what is obvious does not catch attention. We need the faculty of keen observation and ability to solve problems using common sense . Wish 3007 all the the very best. Thanks Surjit for the kind words. You have proved that a number can be as dear as a name.